Have made this little jig some time ago but never posted it but today I needed to make some little discs to fit into a half pipe but did not want a hole in them and I took some pictures along the way . I made them with this little jig that is clamped to my 12” disc sander ,I simply made a plywood disc on the band saw and drilled a 1/4” centre hole so it would fit over the dowel on the sliding part of the jig . The jig has a sliding stop that can be set anywhere along the sliding part of the jig and is locked in place with a bolt from the bottom . A second bolt through the block from the end acts as a fine adjustment and lets me sand the disc to a very tight fit by sneaking up to the diameter . The sliding part of the jig lets me sand gradually toward the rough finish size by moving it toward the sander and rotating at the same time and with the fine adjustment set to oversize I can slowly adjust the bolt and sneak up at the final size . The thin disks that I needed are rough cut on the band saw and fastened to the plywood disc with two sided tape and sanded on the disc sander giving me the exact size of disc with no centre hole . This allows me to make any number of disks the exact same size . 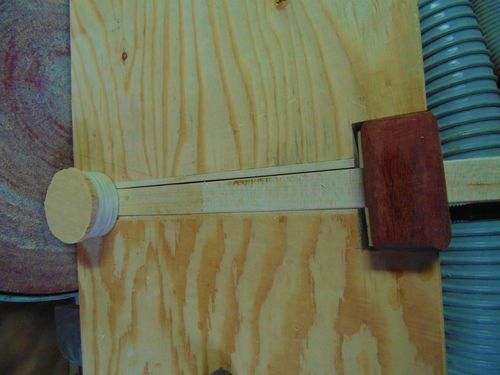 Very nice jig, I made one like only I use mine so the disc can be made to all the same size for my hundreds of wheels I have to make. This is the Idea here ,I sand the plywood disk to the final size and then the following disks are all the same size without having to adjust every time . If you have some pics of yours I would appreciate you posting them here . I like it. It’s now favorited and on my to-do list. Nice tool for the shop and another one I DONT have!! Nice jig—I particularly like your fine adjustment feature that allows you to sneak up on an exact size/fit. This feature is one I can use in other jigs, ergo a favorite. Good thinking! I really like the super accuracy part. Coolsville nice work, a very good Idea. Very slick, Kiefer. I love it. Very smart idea!!!!!!!!!!!!!!!!!!!!!! I like this idea a lot! Very clever indeed! Thanks for sharing this Kiefer! Now that’s a neat jig to make circles with out center holes. Great idea and build. 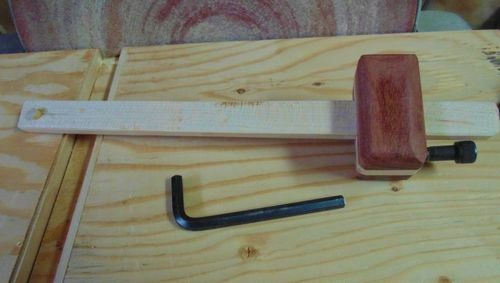 I would recommend that next time you are at a tool store you purchase a sand paper cleaning block and give it a try if you have not done so yet. I use them on anything that sands from a drum sander to random orbital. They are worth the cost under $10 and really work, they keep your paper clean and lasts longer plus sands better. Neat idea when precision is needed. If you have an old tube of silicone sealant that has “gone off” before you have been able to use it, i.e.it has solidified, just peel off the wrapping that formed the tube and you have a belt sander cleaner for free.